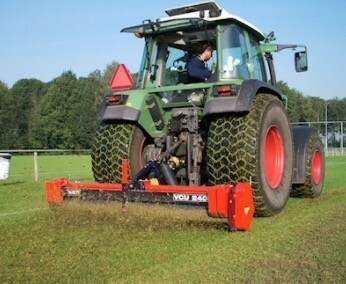 The Trilo VCU 240 Verticutter unit is specially designed for sports fields, flat areas and parks. It is the solution for all your thatch problems. The natural growth rate of grass slows down when a thatch of leaves, old grass clippings, dead roots and moss has built up. That will lead to reduced resistance against diseases and therefore increased vulnerability and growth problems. 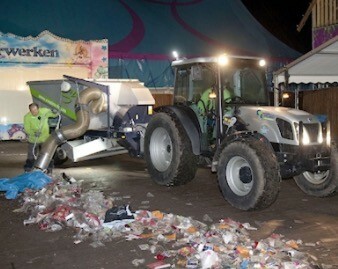 The machine drive is completely mechanical, so it has no hydraulic hoses and cannot leak. The VCU 240 has a working width of 2.40 meters and is constructed on a single rigid frame. 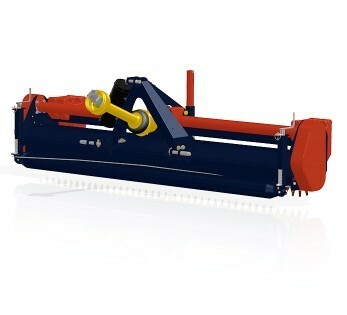 This verticutter can handle thatch build-ups right down to 40 mm without any problem. The verticut blades each have 5 teeth, resulting in longer life. As standard, the machine is equipped with 3 mm thick blades with 30 mm spacing. The working depth is adjustable by means of a stepless adjuster on the left and right sides, which moves the front roller against the verticut blades.